Honestly, I’m a little freaked out. Seasons are changing, new challenges are coming, and what seems like a walk in the park to others feels like a dive in the deep end to me. I’d explain myself in more concrete terms if I could, but it’s hard to put into words (and I rarely run out of words). All I can tell you is that God is moving, and I’m trying to keep up. In John 16, Jesus is moving, and the disciples aren’t keeping up at all. The Last Supper has been served, and Judas has excused himself from the table. Jesus knows that His betrayal has already been set in motion, and Calvary awaits His arrival. He is prepping His disciples for life without Him, although they have a hard time believing that it could ever come to that (John 13:1-3). He spoke of preparing a place for them in John 14 (“And if I go…I will come again”). He reminded them to abide in Him in John 15 (“for without me, ye can do nothing”). But in Chapter 16, He lays out the essential order of God’s plan to transform them from the inside out. The key comes in Verse 7. Jesus explains that He will go away – but His leaving is actually a good thing, because their spiritual maturity depends on His departure. Jesus tells them that the Holy Spirit cannot come to them until He leaves them, and in doing so, He reminds us that there is always an essential order of events in God’s plan. In their three and a half years of following Jesus, the disciples had mimicked the behaviors of Jesus, rarely understanding what they were doing and why they were doing it. The Holy Spirit would finally internalize their faith (John 14:16-18, 15:8, 26-27, I Corinthians 2:12-14). They would be more than just the hands and feet of Jesus. They would transform into men of both action and understanding, with eyes wide open to the heart and mind of Christ (I Thessalonians 4:1-3, 7-8). In Verse 12, Jesus tells the disciples that they can’t handle the truth. He is longing to explain things to them, but they don’t have the capacity in and of themselves to process it (Mark 9:32, Luke 2:50, 9:45, 18:34). They need the indwelling of the Holy Spirit to connect all the dots and guide them to a knowledge of the truth (Verse 13). But here’s what I want you to take away from this. There was a preordained order of events (Ecclesiastes 3:11, Isaiah 44:6-8, Lamentations 3:25-26). God knew what He was doing. And what seemed like an awful development was actually the birthing of something beautiful (John 16:21-22). Salvation would come through the shed blood of Jesus Christ, but sanctification (the lifelong process of becoming more and more Christ-like from the inside out) would come through the work of the Holy Spirit. Do you understand that your life works the same way? If you know Christ as your Savior, God has a plan to sanctify you (to grow you in holiness). There are preordained events that will take place (Psalm 37:23, Ephesians 2:10, ) – some of which may be uncomfortable, painful, and even downright awful – but they are never without purpose. There is an essential order to them, designed to refine you and to internalize your faith on a deeper level. I’ll break it to you as gently as I can. Sometimes things have to leave our lives to make room for the next piece of God’s plan. Sometimes they’re things that we love and desperately want to keep, but God’s way is perfect. 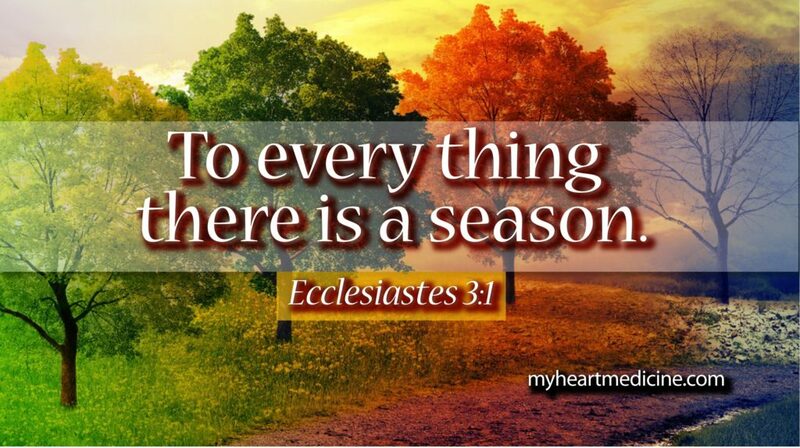 His plan is always good, and He alone knows when the fullness of time has come and the next season needs to begin. Surrender to God’s essential order. Let Him usher in a new season in your life, trusting that your surrender, combined with His sovereignty, will contribute to your sanctification. It takes time to be holy, and sometimes, it takes a new season to deepen our faith. Press on. Press into Him. And prepare to go deeper. Do you feel a new season coming on? Are you being forced to leave behind a season that you love? Trust God’s essential order, and ask Him to grow your faith during times of transition. Thank you for this wonderful word of confirmation! This year has truly been a season of change for me and it’s not over yet. I thank you for your insight into God’s Word and am encouraged to surrender to God what he has asked me to give up. God bless you.